Few actresses have appeared in as many franchises beloved by nerds as Katie Sackhoff, developing a serious pedigree with work on Battlestar Galactica and Riddick – just to name a couple. Rumors have continually swirled that she may soon join the Marvel Cinematic Universe, but no word has come out as to the character she would portray. Now she has chimed in regarding the character she personally would like to take on: Black Cat. Oh, 100% I’d do that! I love playing characters who are multilayered and multidimensional and have a darkness to them, which makes them more realistic and more fun to play. Black Cat is not necessarily the first thought that would come to many people’s minds when they think of Sackhoff entering the MCU. As she notes earlier in the interview, she has taken meetings with Marvel Studios before. Lack of public information about those meetings caused many to assume she may potentially be cast to play Carol Danvers in Captain Marvel – a film which has already been confirmed for Phase 3. While Sackhoff most certainly looks like she could play Danvers – she’s got the blonde hair, athletic figure, and action movie chops – she has firmly stated that she is not interested in playing a hero like Captain Marvel. Instead, her tastes run a little more villainous. 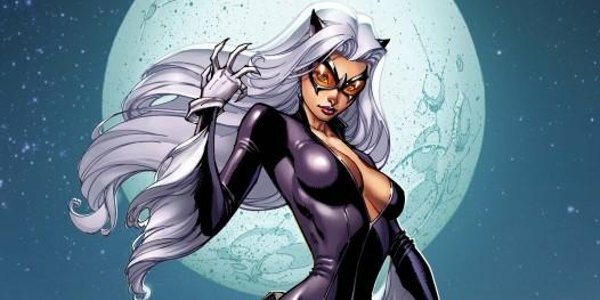 Also known as Felicia Hardy, Black Cat is a popular anti-hero from the Spider-Man mythos. She is an incredibly skilled cat burglar, and in some in some of her appearances has possessed the ability to produce bad luck in those around her. In many of her portrayals she has been portrayed as a love interest to Spider-Man, creating a tense dynamic of hero falling for villain. At 35-years-old, Sackhoff is considerably older than Tom Holland (who will portray Spider-Man as a 15-year-old character) so using Black Cat as a love interest for the hero seems unlikely. Especially considering how she's traditionally depicted in the manner you'll see in the photo below. But if Katee Sachoff's remarks were to lead to her taking on the character of Felicia Hardy, it would mark the first time Black Cat has been seen in a live-action capacity. There were plans for the character to appear in Sam Raimi’s Spider-Man 2, but they never panned out. This lead to Raimi revisiting the idea of bringing the character into the fold for Spider-Man 4, having her portrayed by Anne Hathaway – who ironically would go on to play Catwoman in The Dark Knight Rises, but negotiations brokes down and that never happened as well. With a Spider-Man solo movie still not coming until 2017, anything could still happen with regards to casting. Katee Sackhoff has more than proved herself with geeks across the world, and as such Marvel should take note of her interest in the role if they decide that Felicia Hardy is the direction they want to go in.